One of the most popular nighttime soaps in television history, Dallas ran for an impressive 13 seasons (14 if you count the five-episode mini-series as a season). But, the CBS TV show was seriously running out of gas by the time it ended in May of 1991. The final season ranked 63rd in the ratings, a far cry from its earlier seasons when it was the most-watched series on television. Still, the final season has plenty of drama, with storylines centered around murder, kidnappings, blackmail, seductions, and scheming galore. The cast includes Larry Hagman, Patrick Duffy, Linda Gray, Ken Kercheval, Howard Keel, Sheree J. Wilson, George Kennedy, Cathy Podewell, Kimberly Foster, Sasha Mitchell, and Barbara Stock. Barbara Eden (Hagman’s co-star from I Dream of Jeannie) even stops by to play a former girlfriend of JR’s who’s out for revenge. Dallas regularly ended its seasons on a cliffhanger and the final season was no exception. In the two-part finale, JR gets to see what life would have been like had he never been born. In some cases, things are better. In other cases, his family members are much worse off. Warner Bros. is releasing the final season on DVD and the five-disc set contains all 23 episodes. 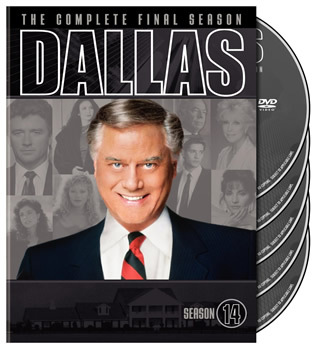 You can purchase the Dallas: The Complete Fourteenth Season for $28.99 or you can also try to win a copy here. To enter, you need to merely post a comment below.You can enter once per day. You can also follow us on Twitter and tweet “@tvseriesfinale Hope I win Dallas season 14 on DVD! https://tvseriesfinale.com/?p=19122“. You can enter once per day. Guidelines: This giveaway is open to participants with a United States mailing address only. (International readers can enter if they have a friend in the States who can accept their prizes by mail.) Many may enter but one person will win. You must be 18 and older to enter and no purchase is necessary. Contest ends February 13, 2011. UPDATE: Congratulations to Jason who won this DVD set in our contest. Thanks to everyone who played and we’ve got more contests coming! I was not a true fan when it originally aired on TV. I followed the series watching some and listening to what others were saying. Years later when the series was available on dvd I decided to watch it from series 1 to 14. Night after night the wife & I looked forward to relax, unwind and get swept away by JR and each new character,especially the women . The fashions and content had never been shown on TV before. I was hooked and became a belated fan. Friday nights are not the same without Dallas, even after all these years. I’ve seen every episode multiple times and it is one of the few series I would like to own own DVD. I can’t wait for the new series! Wow, can’t wait to see the new one once they finally film it! I thought Joel Grey’s appearence at the end was marvelous – well done for J.R.! I would really like to win. This is a great chance to win. One of my favorite shows from the old days!!! Enjoyed hearing Morgan Brittany (who shot JR?) at our HCR meeting in LA. Great series! Too bad it had to end, but all great things must come to an end.